Most people seek medical help when they experience a symptom, for example in form of pain or a disturbance in the function of an organ (problems with digestion, allergic reactions, recurrent infections, fatigue, metabolic disturbances etc.). But such symptoms are mostly only the tip of the iceberg. The illness does not start with the symptom, but rather with faulty information on the cellular level. When our body cannot correct this faulty information (key word: self-healing) then sooner or later this leads to functional disturbances and finally to disorders on the level of organs in the body. An illness arises. If the doctor only tries to treat the symptom per se, and does not investigate the real cause, then the result is often relapses and/or new symptoms. 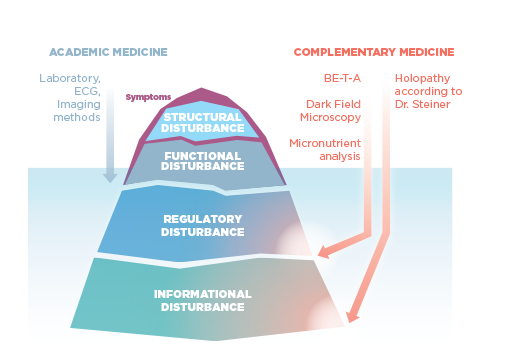 Our special competence lies in combining diagnostic methods from conventional medicine together with those of natural medicine, such as the holopathy method of Dr. Steiner. These methods allow us to see what is happening beneath the surface. It is there that we must look to find the real cause of chronic health problems. Our holistic diagnostics provides the basis for us to work out an individual treatment strategy together with you.